Having used an air compressor for some time now, it’s safe to say that you now know and understand that it is, without doubt, one of the most useful tools you can have in your home. As a handyman, you also understand that your air compressor is only as good as its attachments. Like a vacuum cleaner, the air compressor has room for additional attachments that can help it do its job in various applications. Here are 5 essential air compressor attachments that you, as a handyman, should have. Some of these come packaged with the compressor, while others will have to be purchased separately. Say goodbye to electric powered drills. You can now use a specialized drill with your air compressor for the same applications need an electric drill. These include drilling holes in concrete, wood, and many other surfaces. What is the advantage to using an air-powered drill? First off, it doesn’t heat up the way electric drills do. This means you can use it non-stop, or s long as the job requires it. On a full tank of pressure, you’ll have hours of use for your air drill guaranteed. You’ll have to purchase bits separately, just as you would an electric drill. Likewise, air compressors use the same type of bits as electric drills. A roll cage does not serve a purpose for handymen, but it is meant to protect the air compressor from wear and tear. You see, when the compressor is switched on, it tends to vibrate against whatever surface it is placed on. Thus, the tank can get bruised by friction from machine vibration. Over time, this could lead to punctures in the tank, which in turn causes air to leak out of control, compromising the machine’s performance. When that happens, you can expect that air will be leaking out all the time. Air compressors are capable of generating a stream of compressed air at high pressures, but to work at optimal levels, these machines need to produce at least 100 pounds per square inch (PSI) of air. Unfortunately, some tools don’t operate at such high pressures. An air drill requires only less than what your air compressor can deliver. How do you use that attachment then? You make use of an air regulator. When it comes right down to it, aftercoolers are technically not a necessary. However, an aftercooler can enhance the performance of your air compressor by converting water vapor into liquid through condensation. When water vapor is condensed, it increases the density of air, and the denser the air generated by a compressor, the more efficient it becomes. 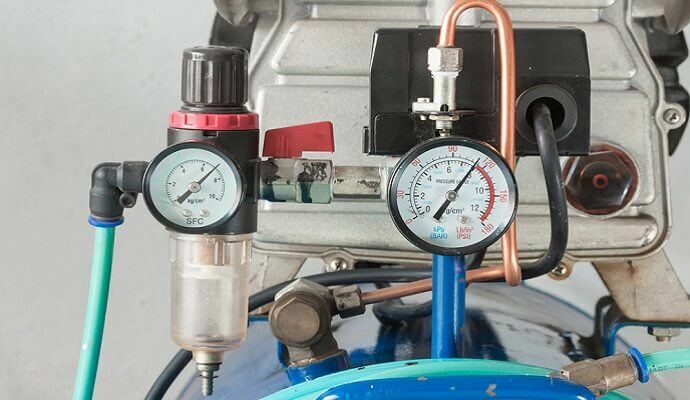 In addition, cool temperatures increase power, allowing the compressor to produce even more compressed air. The fact that you decided to buy your own air compressor probably means that you want to do as many home improvement tasks as possible on your own. Painting is probably one of the most basic and common projects for any handyman, so it makes sense to invest in a paint sprayer, which can reduce time spent on painting tasks by as much as 60%. Of course, these are just five of the many tools that could see a lot of use in any home or workshop with an air compressor. Enjoy being a handyman with your air compressor. Get one if you haven’t done so already; these compressors will prove to be very helpful assistants to you in your home improvement tasks.